Adderall, prescribed to manage human brain activity, not kitties'. Cats and Adderall don't mix. Amphetamine in this prescription drug is one of many pharmaceutical chemicals toxic to your furry friend. 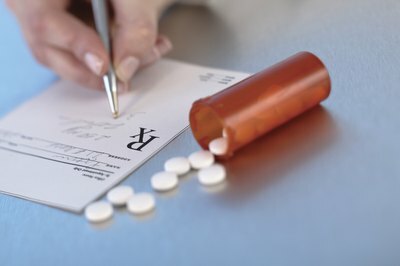 If you or someone in your home has been prescribed Adderall, familiarize yourself with the symptoms of amphetamine poisoning in cats and keep the meds away from the cat's reach. Adderall isn't just another dangerous prescription drug. Dozens of medications are poisonous to cats, but most aren't as problematic as this attention-deficit-disorder medication. The combination of chemicals in Adderall is actually appealing to felines, making them likely to eat it if given the chance, according to "Science News." Rather than taking a sniff or nip and leaving it be, many cats are likely to chow down on an entire Adderall pill with gusto. While a prescription dose of Adderall can do a lot of good for people who have a hard time focusing, the compound doesn't work the same way in cats. A single 20 milligram tablet is well within safety range for adult humans, but it's enough to put a mature cat's life in danger, according to Science News. If your kitty eats a pill, you may notice behavioral changes like unwarranted agitation and sudden aggression, according to the Pet Poison Helpline. Diarrhea and vomiting are also signs of amphetamine poisoning. Seizures and tremors can occur when too much of the drug reaches your kitty's nervous system. Contact a vet or the Helpline if you think your pet got into the Adderall that should have been in your medicine cabinet. Though amphetamines are a dangerous chemical for your kitty to consume, many animals survive the experience of ingesting Adderall. The key is getting medical attention as soon as possible. Your vet may attempt to make your cat throw up to expel what's left of the pill. He may put your kitty on intravenous fluid therapy and use machines to regulate her body temperature. Supportive care is usually enough to help your cat make a full recovery, but it can be expensive, according to the Texas A&M University College of Veterinary Medicine and Biomedical Studies website. No one wants to sit helpless in a waiting room as their pet suffers from poisoning, so preventing the incident from happening in the first place is the best way to maintain your cat's good health. Keep bottles in a closed cabinet out of paw's reach. Never leave pills on a table, counter or elsewhere, even only for a moment. If you drop a pill, shut your cats out of the room immediately and find it. Besides Adderall, be sure to keep other amphetamines from cat's reach. Some nonprescription medication, including cough syrup ingredients like pseudophedrine, are dangerous for your pet's health, too, according to Cat Spay of Sante Fe. Does Heartworm in Cats Produce Sneezing & Nasal Congestion? Can You Give Adderall to a Cat? What Shape Is a Cat's Pupil?